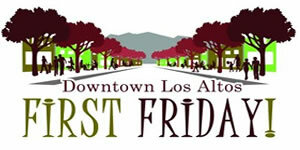 The ambitious 18 acre Los Altos Civic Center Master Plan devised 2009 is in limbo. It was soundly rejected in polling in 2010. Our Los Altos city council has reacted to the rejection of the master plan in city polls and has decided to plan to build ONLY a new community center as a first phase. That seemed to be what the survey said people preferred. No new city hall, no new police station. Just a community center please. Our city council directly that the new community center building would be on the 8 acres of the total site that used to be a school. No other building – the city hall, the police station, would need to torn down or disrupted if the community center were build on that part of the 18 acres. 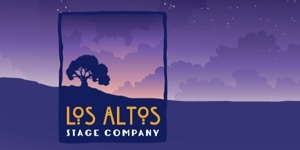 But now, a separate governmental entity, the Los Altos School District, is saying it needs more land, more sites, to accommodate future Distrist growth and also to handle the growth of our local charter school. One site the District has its eye to accommodate enrollment growth is the Hillview School site – an 8 acre parcel , a part of the total 18 acres at the civic center site at Edith and San Antonio. Can the district morally lay claim to the 8 acres of the Hillview site, part of the the civic center? Apparently Yes. It is absolutely true that the old Hillview School site was sold by LASD to the City of Los Altos in 1975 with the intention to keep it safe for resuse as a LASD school at some distant date in the future. Is that time now? 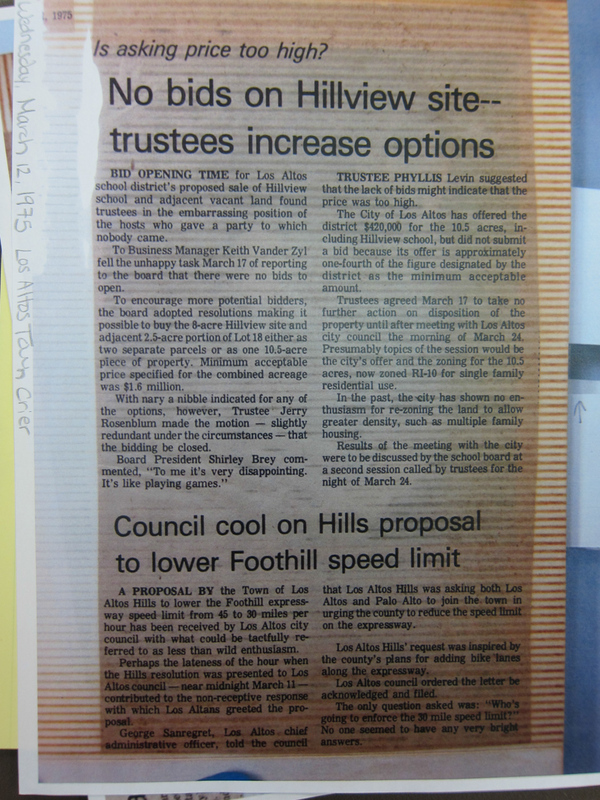 Carole Kuiper of the local League of Women Voters with the help of the Los Altos History Museum has found the Town Crier articles which document the intention to save the Hillview land for resuse as a school. 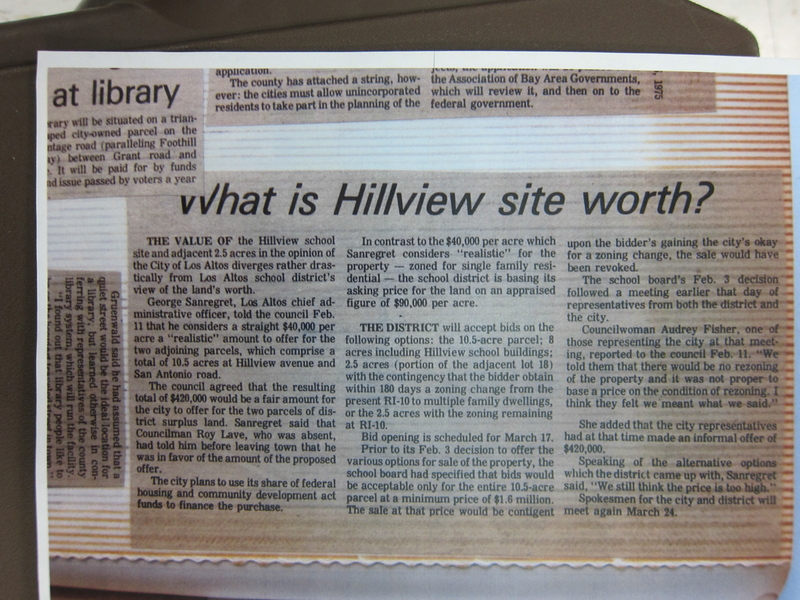 What is Hillview Site Worth? No bids on Hillview site. City Hall Offered Rights to Acquire School Property. 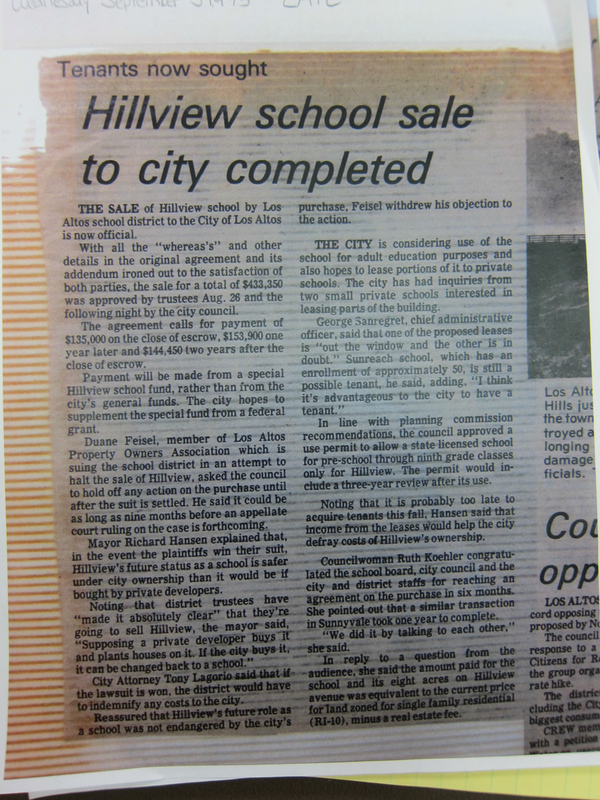 Hillview School sale to city completed. 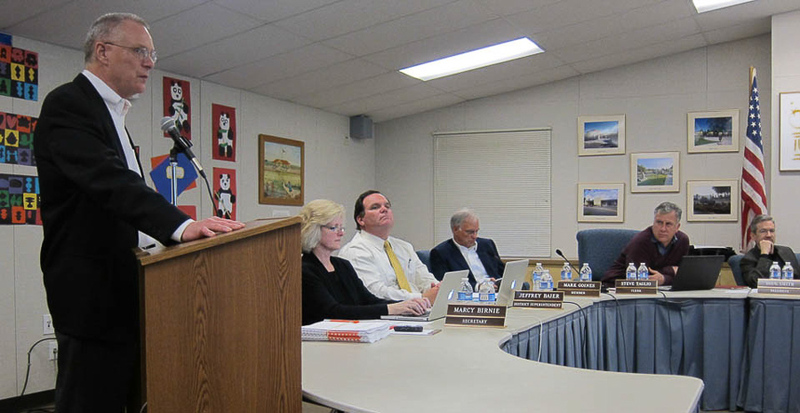 In those times, the Los Altos Property Owner Association was attempting to totally halt the sale of the eight-acre Hillview site and the District’s entire school redistricting and consolidation plan by suing LASD. But “reassured that Hillview’s future role as a school was not endangered by the city’s purchase of it, the head of the association withdrew his objection to the city council action to purchase the Hillview site.” So that is how it happened folks. Former Mayor Roy Lave at MVLA League of Women Voters. In 1975 Lave was on the Council and helped rezone Hillview School as Public Facilities, helping to save the parcel for public uses. With the zoning held at only R-10, the District did later receive one bid of $425,000 [sic on the 8-acre parcel] from Woolworth Construction Co., a homebuilder. At that point the District offered the parcel to the City, but it had to act within the week, or the parcel would go to Woolworth. The district offered the City the eight acres for $405,000 which was the same as Woolworth’s bid, less the commission. 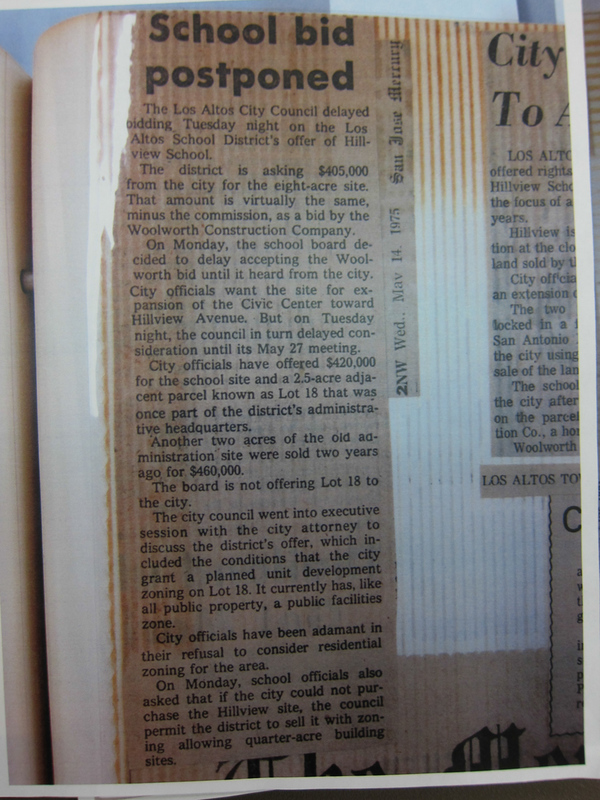 The City delayed till its May 27, 1975 meeting any decision. On August 26, 1975, the District trustees and then on August 27 1975, the City Council approved a final contract for the 8 acre parcel for $433,350 to be paid over two years. 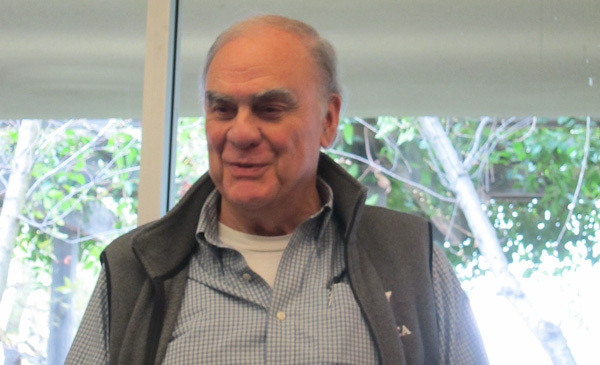 Duane Feisel, a member of the Los Altos Property Owners Association, was according to the reporter, “reassured that Hillview’s future role as a school was not endangered by the the City’s purchase,” Feisel withdrew his public objection to the council’s approval of the purchase. What about the 2.5 acres? The research materials on hand do not quite answer the question, what happened to the 2.5 acres of Lot 18. Where is Lot 18? 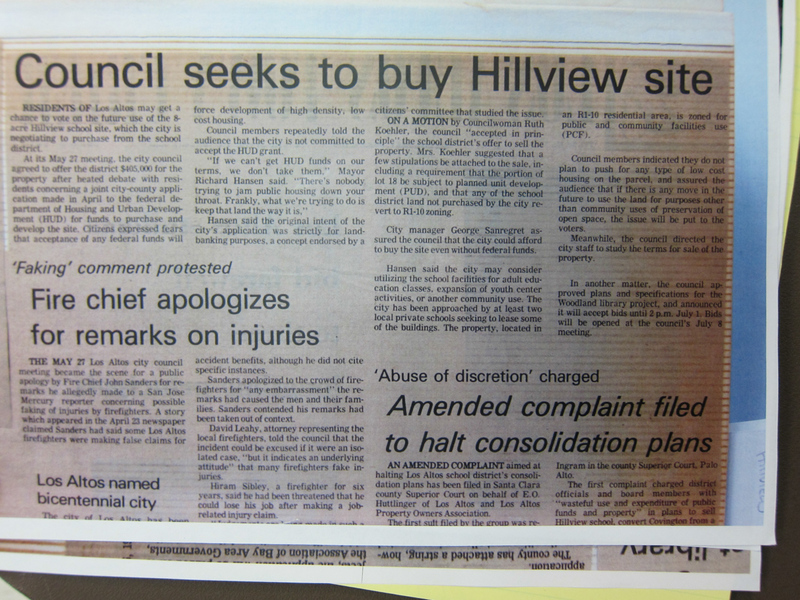 City finds a tenant to occupy part of Hillview in 1975. Lots of empty space at first apparently. About a year ago, a new non-profit was formed in our town called Huttlinger Alliance for Education (HAE). They provide money and expertise to fight the charter movement in the legal arena and also via public relations campaigns. HAE has said they adopted the name of local personality E.O Huttlinger who was active in the 1970’s. 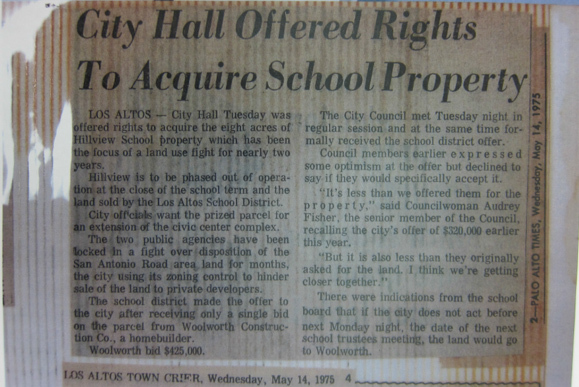 Apparently the first Huttlinger was affiliated with the Los Altos Property Owners Association and filed suit to stop LASD’s 1975-76 consolidation plan which resulted in the sale of Hillview and Portola elementary schools and the closing of Covington as a junior high. In 1975 the Hillview School site was purchased by the city to save it as a school, but it was also purchased to extend the community center. 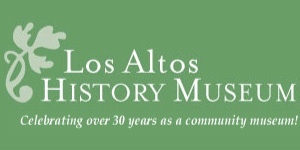 The residents of the city of Los Altos and surrounding areas have enjoyed the Los Altos Community Center 8 acres for nearly 40 years. Seniors use it. Non-profits including Friends of the Library have essential offices there. The Recreation department serves four school districts and thousands of adults a year. Now residents and voters must weigh what is the right path forward for the Civic Center / Community Center in 2014.
a dedicated LASD school on the Hillview part of the 18 acres? Can we part with all or most of it? 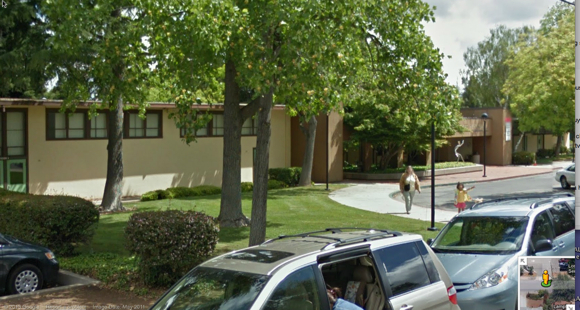 a LASD school with some shared facilities? – maybe a shared multipurpose room?, a shared baseball field? TBD. BCS offered to sign a 15 year agreement to remain split on Egan and Blach and to cap BCS enrollment at 900, drop litigation, etc. Note: neither of the above close a school. Lalahpolitico: So why the LASD trustee hesitation?